It was absolutely freezing here last night - so i am sitting wrapped up in bed like an eskimo using my new toy! It has been very useful! I have been researching all manner of headscarfs, wigs etc for the forthcoming chapter. I am afraid to say that most aren't terribly appealing. I had to laugh while watching greys anatomy I saw one of the surgeons was wearing a funky theatre cap - so I even googled those - quite a selection I have to say! I have been intrigued to see all the wigs available and have discovered that you can even buy a fringe to wear under a hat - for a more naturelle look! The girls and I were thinking that you would look pretty funny if your hat came off and your fringe was left stuck to your bald head!!! Not a great look! I have also found out that breast cancer is the only cancer where when you are having treatment you put weight ON !!! How unfair is that! I am sooo looking forward to being round and bald and now that my oestrogen levels are in my boots I will be redfaced with hot flushes and flaking with dry skin. Yippee I can't wait !!!! I guess I will save money on shampoo though !! So it was off to the radiotherapy oncologist yesterday.We had to go to a private place as for public I would have to drive over an hour and a half every day 5 days a week for 5 weeks . It was just opposite our local hospital so easy to get to! I sat in the waiting room - the walls were covered with info and posters related to various types of cancer etc . Pamphlets on all the various side effects! There were a few others in the waiting room - all probably 20 years older than me and we smiled at each other with that knowing look as to why we were all sitting there!! The Oncologist was a lovely jolly man and very easy to talk to. It seems that radiotherapy is definitely on the cards after all. He was very honest when discussing side effects - not very pretty Im afraid. Permanent damage to skin where radiation hits, peeling and burning, possible lung infection and lymhoedema!! As my friend said cancer is the gift that keeps on giving!! Pity the presents weren't more joyous! Nevertheless the good news is that amazingly although my pathology indicates an aggressive cancer , the oncologist said that it is not acting as one with my lymph nodes being clear etc. He said I had the high percentage recovery band and that I would be around to see my daughters get married! It was hard holding back the tears when he said that! 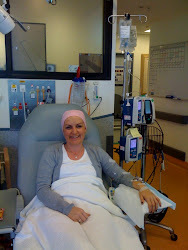 The radiotherapy would only start after the chemo so will wait until 31 May to know whats what. In the meantime I am pushing the physio exercises !! Eek! My last couple of weeks have been journeys from home to appointments and back and forth. A friend was encouraging me yesterday to get out a bit and we were just chatting about how I felt about it. I hadn't really thought about it as I have been so preoccuppied with sorting out the pain etc I realised that actually it is easier just to stay in the comfort of my own surroundings than to get out and live life again. It is the girls sports day on Monday and I am going to go - but on thinking about it I do feel a bit nervous about going public - not sure how I will be. Funny I wasn't aware that it would be an issue and I am writing it here almost to be accountable to go - so I cant chicken out!! Not sure why I feel a bit confronted by that - maybe its just the reality of where I'm at! Well I better get out of my cosy nest and get some breakfast and get ready for the day! !